Sometimes the only way to get through the holidays is by laughing your way through the season. While they are magical and fun, at times they can also be stressful, busy and filled with small talk. (that can be a little awkward at times). 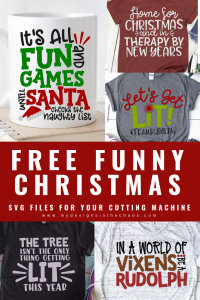 These free funny Christmas SVG designs are made with that in mind. They will work as conversation starter and will even give you a fun project to help you unwind. If you don’t find exactly what you are looking for below then check out more of our free holiday files here and some funny winter designs here. All of our designs are available for personal and commercial use. We absolutely love to see how you make them come to life! Make sure to post a picture over in our Facebook group or on our Facebook page showing off your finished product! This licence is limited to 200 uses per design and must be handmade by you. We do not permit outsourcing of our designs to be used with any print on demand shops in any way. (Amazon Merch, Printful, etc.) They are designed for small business use with your cutting machine. For additional licencing questions or clarification on our policy please feel free to reach out. Please note that we do use affiliate links. This means that when shopping through one of our links at no extra cost to you we earn a small percentage of the sale. I think out of all the designs on this post, this one might be my favorite. This would look so great on a shirt, mug (like pictured below), holiday pjs, or even on a simple dish towel for some fun added holiday decor in your kitchen. This holiday glitz package of heat transfer vinyl would really add some fun shimmer to the design. 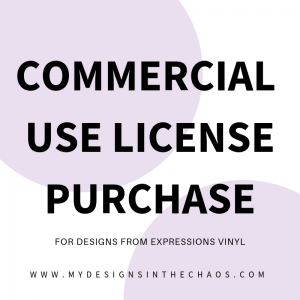 If you aren’t sure which type of vinyl you might need for which project head over to this post where we give you a guide to help determine which type is best for which project. We also give a super easy tip here on how to make sure your vinyl is always centered! Even though we are showing this design on a t-shirt mock up below I can see it being so adorable on a wine glass! This set here are pretty and colorful, and even have lids so if they get knocked over during the hustle and bustle of the holidays you won’t loose a sip! Unsure of what I mean when I say mock-up?…. Check out this post where we give you some free mock-ups to practice with and explain exactly what they are and how to use them in detail. Also if you are going to put this on a glass make sure to use 651 adhesive vinyl so that it doesn’t come off. And even though it is permanent vinyl it should still only be hand wash. We have some printable care cards for you to place in orders for customers for free here. Those little touches will help you to stand out above the others doing the same thing as you. Find more of our tips to stand out here. This phrase just makes me chuckle every time I read it. They say that the funniest jokes are because there is a little bit of truth in them. Maybe that is the case with this one… what do you think? The theme of this design is Be You and Be Kind. The world is filled with plenty of people who are trying to strive for a perfection they will never reach or only looking out for themselves. Give the message of kindness even during a stressful holiday season with this simple but powerful design. If there is one thing that y’all take away from reading this blog and visiting our shop, it’s that we are here to encourage you in your journey and serve y’all with the talents we have been given. See… we have each been given unique gifts and we were designed to use them. As I have mentioned before on here, passions aren’t random… they are callings! So, go grab some vinyl put this great message out into the world on a shirt, sign, or even ornament and serve your people. The world needs what YOU have to offer! This design is another funny one. Who do you know that needs it? I can see it being perfect on a shirt or even on a can cooler. For a can cooler make sure to use heat transfer vinyl. This flocked HTV kind would really give a fun dimension to the project. As we learned (on a FB live) in this tutorial for making funny socks, make sure and peel the flocked HTV once it has cooled. If you peel it while it is still warn the vinyl won’t stick. One of the things that helps us continue to provide free files for y’all is when you pin our images. So please take a moment before downloading below and pick your favorite ones to pin. We greatly appreciate your support. If you enjoy these files then head over here and browse the holiday ones in our shop. We have a little something for everyone and you are sure to find something that you love! You and I definitely have the same sense of humor (chaos). I love these designs and many more on your site. Yay! I’m so glad that you love them! 🙂 We have so much fun designing them! I am so loving all of these! I haven’t made any t shirts yet..but I am going to do these! I’m so glad you are enjoying them. We have so much fun providing them for y’all! Thank you Michelle! This is a gift! Love all of them! I’m thinking of making a t-shirt for my daughter who will be home from college using the “Home for Christmas and in therapy by New Years”. I think she would seriously get a kick out of it! LOL Thank you for providing these. Thank you so much for your great designs, ideas and tutorials. Absolutely! Thanks for being here and being a part of it. We really appreciate it!